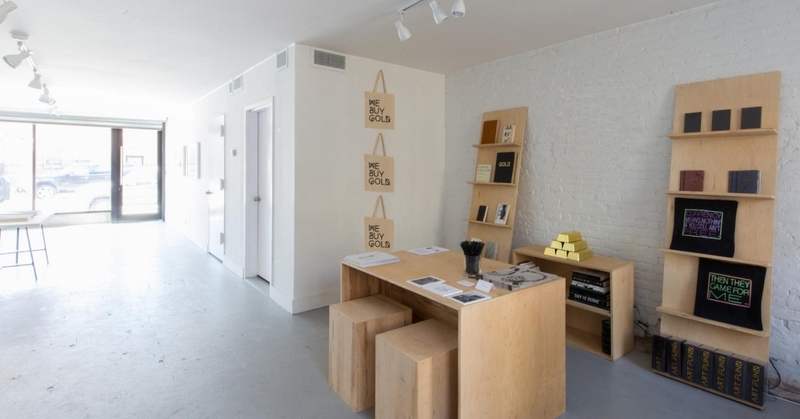 In the Spring of 2016, Chicago-based artist Daniel G. Baird presented his first solo show with PATRON Gallery. 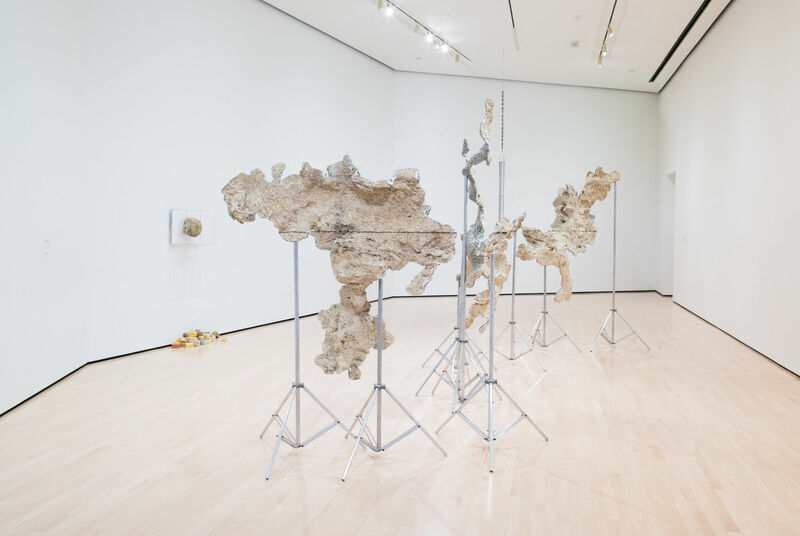 The exhibition, entitled When, featured several ongoing series, showcasing Baird’s use of archaeological sites and remains to source the concepts and material for his sculptural practice, including two large-scale works titled When I and When II. An example of this particular series would be shown again this past Fall for the group exhibition presented by EXPO CHICAGO in September, entitled Singing Stones at the Roundhouse at the DuSable Museum of African American History, organized by the Palais de Tokyo. Drawn to both their figurative associations and their actual formations, Baird combines the natural and the industrial to create a tension in his work that points towards an inevitable and infinite march of technological progress. During a visit to Baird’s studio, I posed a few questions about how working with these concepts of representation and layers of time have developed over the last couple of years. A transcription of the conversation is below, wherein we discuss his first major solo museum exhibition, the sublime, and of course, caves. Ryan Filchak: You recently opened an exhibition at Michigan State University’s Broad Museum, entitled Field Station. Can you speak to this experience, and explain how your approach in this presentation shares a dialogue with your past work? 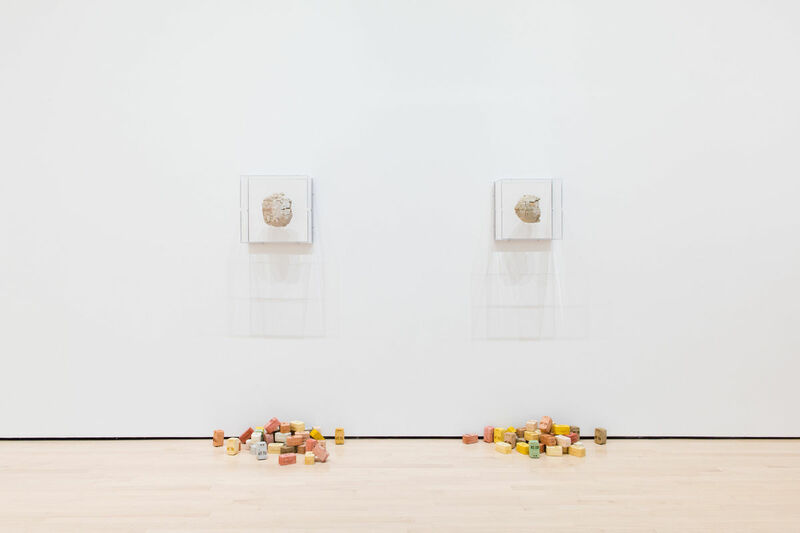 Daniel G. Baird: The exhibition at the Broad Museum was a timely opportunity for the present iteration of the work, and it allowed for a conversation across the institution’s various disciplines that I had not anticipated. Notably, the dialogue I had with the MSU Museum’s new Director and anthropologist, Mark Auslander, offered a unique perspective of museology and ideas around Early-Paleolithic shamanic expression, which has really stuck with me. The Fieldstation series—a term used to refer to an off-site laboratory to conduct research—lends itself perfectly to some recent developments in my practice, and I was very grateful to [Curator] Steven Bridges for his assistance and recognition of these threads. Leading up to the exhibition, I had been steadily producing a body of work that emerges from a particular cave-site in the Midwest. This location, by my persistent sourcing from it, has in a sense become my own ‘field station’ for the development of this body of work. The opportunity to conceive and produce a work for this exhibition series allowed me to critically reflect on the function this location had within the larger scope of my practice. Moment IV, 2017. Fossilized tortoise, aluminum, acrylic, 3D printed hardware. 15.75 x 17.5 x 10 inches. Image courtesy of PATRON. 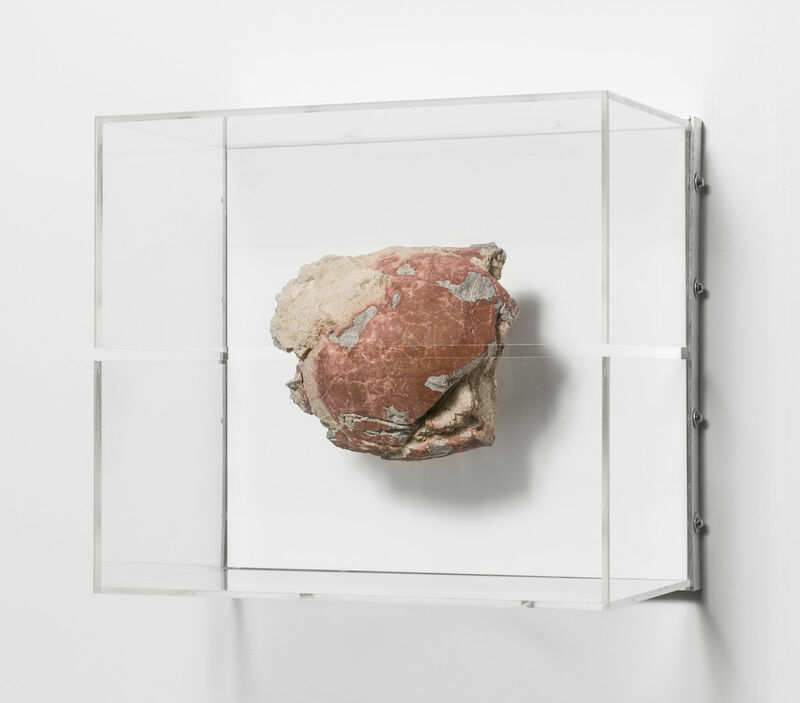 RF: For this exhibition, you presented new pieces that revisited a signature method of production—fragments of cave walls are rebuilt as a 1:1 models, then mounted and displayed on aluminum stands, and plastic hinges made with the help of 3D printing. Does the source material for the natural elements of this series come from a specific location? DG.B: When I began producing the caveworks, I was interested in the idea of ‘cave-ness’ where the specificity of location was not all that important. I was drawn to the idea that a 1:1 replica of a cave-surface alluded to, and contained, all other subterranean spaces, while simultaneously referencing the believed source for all creative expression and external representations by humanity. My initial interest in acquiring these fragments was to display them within proportions of contemporary screens, establishing through this comparison an analogy to a historical lineage of representation. In terms of geological timescales, looking into an iPhone or television screen and gazing at the play of images by candlelight on cave walls are very recent phenomena. RF: Aside from the screen dimensions you reference, have you added other elements of technology into your practice? DG.B: Yes, in Spring 2017, I bought a 3-D scanner, typically used to replicate the facades of architecture, to the cave site that I had been sourcing the fragments from. I made a detailed scan of its interior—the desire to capture these walls in a digital format felt like a logical next step of bringing the cave-surface into the screen itself. It was only after I produced this precise model of the cave’s interior that the source changed for me, and became something very specific and important to the rest of the work. It acquired a sort of sacred provenance that I was very reluctant to acknowledge prior to this moment. The digital acquisition born of the process turned the form of the cave into a temporal object, capturing the form of the site at the precise moment when the scan was taken, similar to a photograph. I like to think of Kurt Schwitters’ Merzbau in relation to this. The Merzbau was an immersive environment that Schwitters created in his Hanover home between 1923 and 1937—it was an artwork that was subject to perpetual modification and change. In 1933, photographs of the structure were taken, fixing the changing format that moment in time. These photographs were then used to approximate a reconstruction of the piece at the Sprengel Museum in Hanover. Field Station: Daniel G. Baird, installation view at the MSU Broad, 2017. The Eli and Edythe Broad Art Museum at Michigan State University. Photo Credit: Eat Pomegranate Photography. The concept of preservation, and the desire to arrest objects from inevitable entropy, is an interest that I have had throughout all of my work. The Merzbau captured through those photographs presents the possibility for its future reconstruction anywhere, and at any time, in a similar way to how the 3-D scan of the cave can manifest itself both digitally and physically as the moment of when it was captured. Recently, I returned to the physical cave itself to produce some new work, and was delighted to find the ground near the entrance covered in ice stalagmites from the dripping ceiling, which are nonexistent in my precise virtual model from May of 2017. 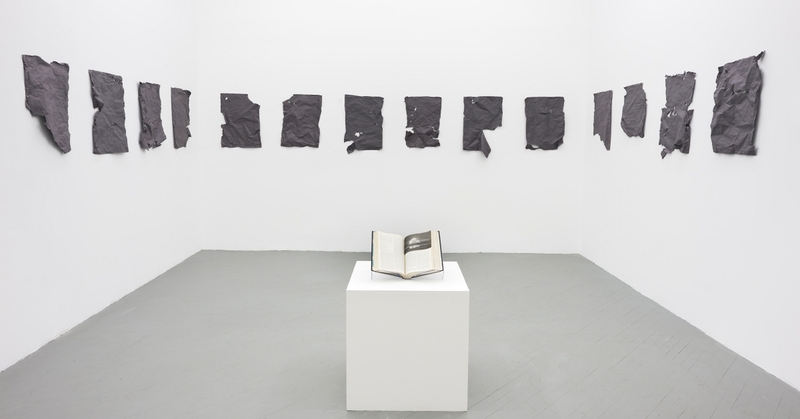 RF: You have also mentioned that these works can be read in tandem with Robert Smithson’s Non-Site Theory. Could you explain how pieces from your When and Moment series expand on this idea? DG.B: The Non-Site analogy is a way to think through how many of the things I reference and utilize in my work point elsewhere— whether it be to a different location by way of a direct 1:1 reference, such as the directly sourced cave-works of When, or an entirely different timescale by way of an object with a deep geologic history, as seen in the Moment series. The works in Moment hinge on the established belief of tortoise mythologies, whereby these creatures contain the entirety of the world within their shells. I feel the tortoise shell mythology alludes to a desire for memory—of holding onto the past, which we all do in our various forms of recollection. I began to think of the tortoise in relation to the idea of epigenetic memory (the accumulation of an individual’s mental memory throughout their life) and epiphylogenetic memory (the inscription of memory onto objects). This led me to the analogy of how a tortoise, at the time of its death, captures within the confines of its shell the entirety of the world as it existed in that moment. For this work, I specifically sourced freshly excavated fossilized shells from roughly thirty million years ago, as a material fact to deep history. I see them as ‘photographically’ containing the world from where they came; as locks without keys to comprehending such a distant time and space. RF: Moving away from those precise moments in past series, you have begun to manipulate your source material to a greater degree than before. How do you interpret the introduction of the artist’s hand into these cave reliefs when changing the surface through marks or sculpted surfaces that deviate from the original? DG.B: In all of my work, the hand—and tactility in general—is an important element that connects to a base understanding of human touch in contrast to a lot of the presentation systems I have developed. My initial intent was to use the cave surfaces as a type of tabula rasa, where an infinite history of mark making could unfold, yet also work as references to sites that commonly hold a deep significance to the development of representation, tool-making, and consciousness. The technique used in the acquisition of the surfaces requires a very tactile engagement by pressing silicone into the wall surface to capture its detail. I sought to re-connect this tactility in the fabrication of the works by incorporating finger impressions onto the backside of the sculptures. Adding an additional gesture to the actual surfaces of the works themselves had initially felt like too heavy of a move, and I feared it might bring the works into a type of didacticism. I have since relaxed in this apprehension, and have begun to introduce horizontal gestural lines by physically marking the surfaces of the walls, which connects to other interests in the sublime present in other bodies of work. Physical gestural modification to the actual structure of the cast surfaces is something I am actually working through at the moment. RF: In addition to these gestures, with the inclusion of screens into your work, both through dimensions and through material, the viewer must also connect the origins of mark making with modern communication methods. Do you find it frustrating, rewarding, or something else entirely to simultaneously reference past and present through your work? DG.B: The romantic notion of the sublime is something that I think about often. Traditionally, it is this overwhelming sensation of the crushing and awesome power that the experience of the natural environment can have on our consciousness. I like to graft this idea to technological objects, and the seemingly infinite possibilities contained in their development. Astronauts speak of an experience of sublime wholeness when they exit Earth’s atmosphere and see the fragility of the “pale blue dot” when it is understood as an object and the sphere wherein all of history and meaning has unfolded. It is an experience termed the “Overview Effect.” In working with such timescales in my work, I am interested in alluding to this deep oneness and perspective of a continuum that far exceeds our limited comprehension. DANIEL G. BAIRD was born in 1984 in New Jersey. He is currently living and working in Chicago, IL. He received his BFA from the School of the Art Institute of Chicago and his MFA from the University of Illinois at Chicago in 2011. 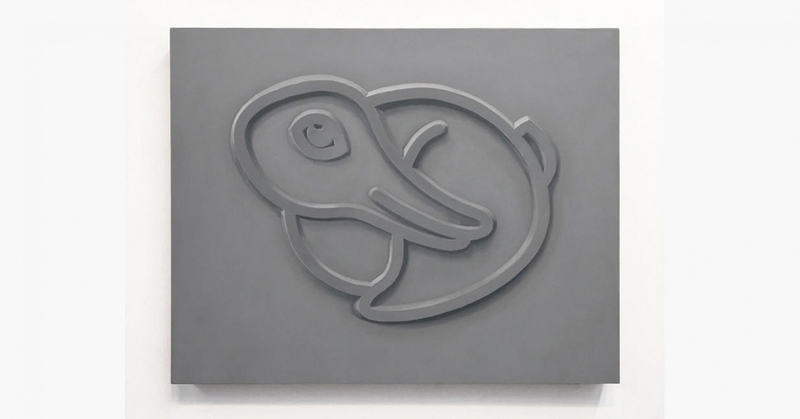 Recent exhibitions include Singing Stones, organized by the Palais de Tokyo at the Roundhouse at the DuSable Museum of African American History, Unthought Environments at the Renaissance Society, and Bearable Lightness of Being at GRIMM Gallery in Amsterdam, where he will present a solo exhibition this Spring at their New York space. Solo exhibitions include FieldStation at the Eli and Edythe Broad Art Museum at Michigan State University, and When at PATRON in Chicago. Baird currently teaches as a Lecturer in the Sculpture Department at the School of the Art Institute of Chicago.